Most health-conscious people and those with a poor cardiac history prefer to eat chicken over red meat. Chicken is lean meat and is undoubtedly good for your health. Along with keeping your fats under control, it gives the required dose of proteins, vitamin B12, and other nutrients. But, what about other types of meat such as turkey and beef? Is turkey healthier than chicken? While these poultry products have a lot of nutrients in common, it is the flavor, taste, and preference that also matters. Turkey happens to be naturally more flavorful, while chicken is a bit bland. However, we can make chicken taste delicious through some recipes. We will also consider the nutrients in beef and if the turkey is healthier than beef, and the reasons for the same. With both being poultry products, can we substitute turkey for chicken? Well, not exactly, but we can have it some days in a month or so. 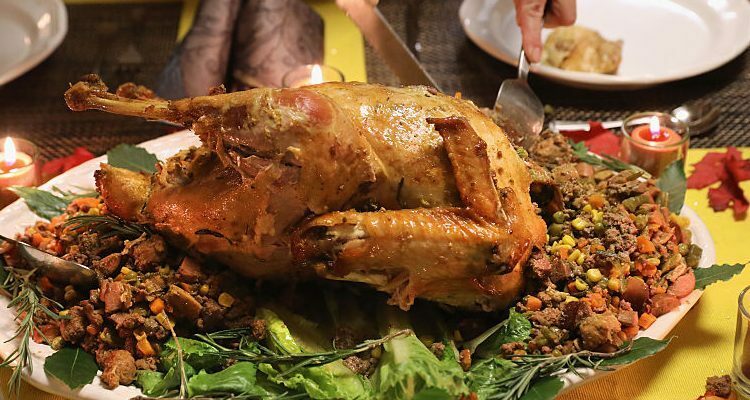 We all know turkey is commonly eaten on Thanksgiving, but what about the rest of the year? Let’s find out if and how much we can have a turkey and its health benefits. One serving of turkey contains about 220 calories and a good dose of proteins including tryptophan; but, thankfully, the amount of the amino acid is not high enough to make you feel sleepy. One cup of chopped and cooked turkey, which is roughly 140 g, contains 41.9 g protein, out of which tryptophan is 476 mg. It contains all essential amino acids, such as proline, serine, lysine, isoleucine, and more. On the fats front, the same amount of turkey has just 1.4 g saturated fat, while the remaining approximately 3 g includes omega-3 and -6 fatty acids and mono and polyunsaturated fatty acids. Turkey also contains about 97 g of cholesterol. Turkey has good amounts of the vitamin B group—especially B6, niacin, and riboflavin, and trace amounts of vitamin E. Turkey is rich in minerals such as selenium and phosphorus. It also has fair amounts of iron, magnesium, potassium, and zinc. Now that we know the nutritional values of turkey, let’s compare it with that of a chicken. Approximately 43 g of whole, cooked chicken without the skin contains 167 calories. The protein content is roughly 55 g. The saturated fat content is just 1.8 g, while the unsaturated fats that include poly and monounsaturated fats are about 4 g.
The cholesterol content is about 75 g. The content of vitamins and minerals is also more or less the same as that in a turkey. So ideally, we can have this twice a week and turkey twice a week. On the other three days, we can have eggs, lentils, and nuts to substitute our protein intake. This will create a variety and spread our protein intake evenly. These protein-rich foods should be combined with whole grains, vegetables, and fruits to get the right balance of nutrients. You can have these meats for breakfast or lunch. You can have a chicken or turkey sandwich or add chicken pieces to your bowl of salads. You can even combine it with rice. Beef, on the other hand, is high in fats, especially saturated fats, and we tend to eat processed beef such as sausages and salami more. So, we should restrict it to, say, about three to four times a month or special occasions. Also, we should ensure the required amount of exercise every day and especially when we eat beef. Beef consumption has been linked to heart disease and certain types of cancers. However, more evidence is required to prove these theories. Processed turkey, like any other processed meat, makes you prone to health risks. Primarily, this is because additional salts are required to preserve these meats. Also, if a turkey is smoked, it releases carcinogenic nitrites. So, eating a fresh turkey or chicken is always recommended. Avoid eating turkey bacon, burgers, or hot dogs. Trying to find out the source of the turkey is important because it helps you determine if it is pasture raised. Ensure it is not given any antibiotics. As always, moderation is key. If you restrict yourself to eating the right portions of a fresh, pasture-raised turkey, there are no known side effects as such. But eating a processed turkey frequently is said to possibly contribute to heart disease, hypertension, raised cholesterol levels, and more. You can certainly enjoy both chicken and turkey by eating the right portions and alternating them. We would suggest you to avoid beef mainly due to its fat content and the probable health risks; reserve it only for certain occasions. If you have to have beef, make sure it is of a grass-fed cow. Also, the beef you normally get is smoked or processed and loaded with salts, which can further contribute to health issues. Even when eating turkey or chicken, make sure you eat fresh meat and not the processed type. You can combine them with some vegetables and whole grains to get your daily dose of the required nutrients. With chicken and turkey, you do get a complete dose of proteins. For a change on certain days, substitute these birds for eggs, fish, or nuts. As long as you spread your intake evenly through the day and eat in moderation, you will get the required health benefits.